The only tube phono stage from the world reknown AudioValve Germany products range. "Germany's AudioValve is building some of the finest and affordable tubed products available today. The Sunilda is a great example. Loaded with features, beautiful sonics, and a price that makes this phono stage a veritable bargain in the context of its' competition. The Sunilda uses 2 (two) 12AX7 and 6922 each making it a tube roller's delight. Personally, I've used Telefunken, Siemens, Mullard, Amperex, and RCA among others. The many different combinations of tubes make for an unlimited number of possibilities you might find satisfying. I've been listening your Sunilda you'll be hard pressed to buy more for its' price and perhaps even a couple thousand more. Inputs for 2 MC or 2 MM cartridges at the same time; ideal for the enthusiast with a 2 tables or a table with dual tonearms. Front panel controls for loading and capacitance. External power supply for superior isolation and on and on. The Sunilda is one terrific value." A view of the compact and absolute wireless electronic - riaa modul from SUNILDA. There is no hum, bee or any noise - only music. The design on a double side pc board is constructed in double mono technology, use best and selected components and guarantee high stable and highend vinyl re - productions. Un aper�u sur le module riaa compact et absolument �lectronique sans c�ble, le SUNILDA. Aucune sommes, grondement ou l'autre bruit - seulement la musique. Le design sur une carte imprim�e bilat�rale est construit dans la technologie Mono Double. Seulement les parties meilleures et les plus choisies �taient utilis�es pour garantir une haute stabilit� et une lecture de Vynil de haute vol�e. 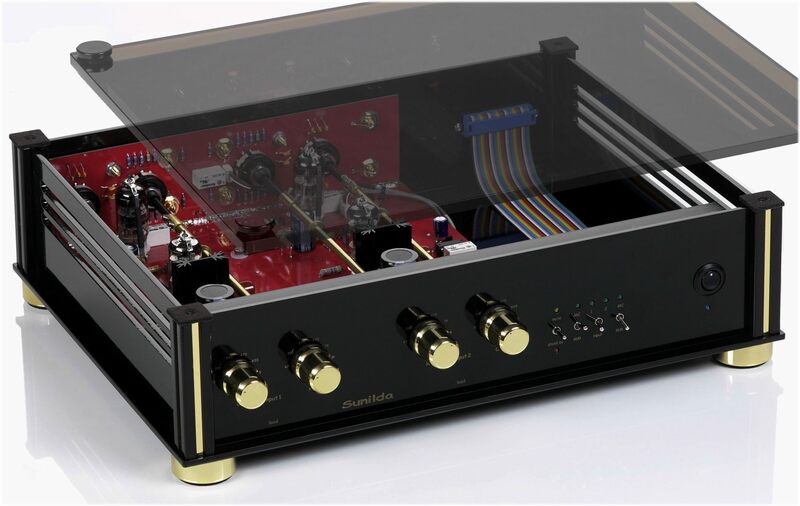 Sundila is a three stage phono-preamplifier, based on 6922 (ECC88) and 12AX7 (ECC83) frame grid tubes, suitable for two MM- and MC-cartridges at the same time. Independently for the two phono inputs, impedance and capacitive load can be set separately and 'on-the -fly' while listening. Thus the user can easily configure the unit to match the features of the cartridge by selecting the optimal input resistance and capacitance for each input separately! Sunilda est un pr�amplificateur de Phono trois �tages, repos� sur des 6922 (ECC88) et 12AX7 � (ECC83)tubes de grille de cadre, pour un MM et un MC t�te de lecture au m�me temps. L`impedance et le charge capacitaire peuvent �tre r�gl�s individuellement pour les deux entr�es de Phono au temps le plus court pendant on entend la musique. Comme ca l'utilisateur peut configurer facilement l'unit� pour comparer les qualit�s des t�tes de lecture en il choisit la r�sistance d'entr�e optimale et la capacit� pour chaque entr�e de mani�re s�par�e! Switches in front are found for: MM/MC mode for each input; input 1 or 2; selectors are used to select different resistor and capacitive input loads. 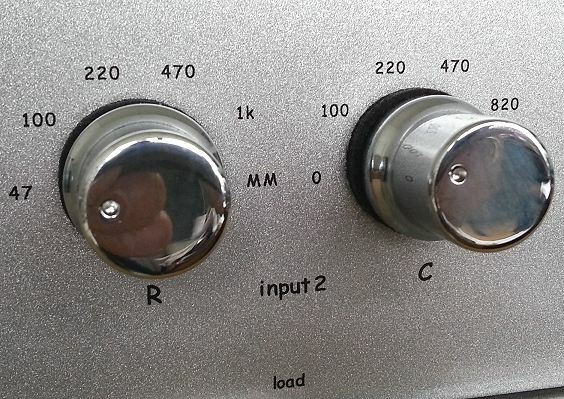 In MM mode the gain will be 23 dB lower than MC and at a fixed input-impedance of 47 K.
In MC mode the preamp will have 20 dB higher gain and switchable input resistors and condensers. The RIAA de-emphasis is passive and split between the first and second stage. Dividing the RIAA network over two amplification stages lowers the insertion losses of the passive network dramatically. Furthermore, the design holds a total absence of feedback, thus increasing the overall dynamics. Power supplies are solid state regulated. This is the best way to obtain a low noise and supply line with a very low impedance that will increase the performance in the lower frequency range. 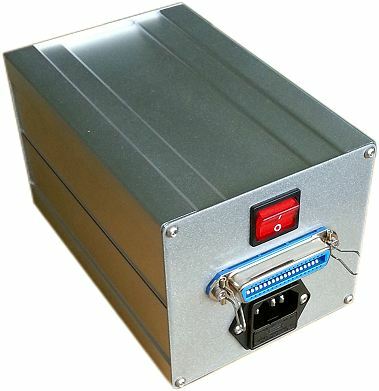 The power transformer is housed in a separate aluminum case. Sur la face, des commutateurs se trouvent pour chaque entr�e dans le mode MM et MC; entr�e 1 ou 2. Les commutateurs sont utilis�s pour choisir les r�sistances diff�rentes et les charges d'entr�e capacitaire. Dans le mode MM, le revenu est plus bas pr�s de 23 d�cibels que dans le mode MC et se trouve ainsi � un impedance entr�e stable de 47 K.
Dans le mode MC, le pr�amplificateur a un revenu plus haut de 20 d�cibels et les r�sistances d'entr�e ainsi que les condensateurs pouvant �tre commut�es. Le point principal RIAA est passif et est divis� entre la premi�re et deuxi�me stage. Le parcellement du secteur RIAA plus de deux marches d'amplificateur baisse frappant les pertes d'entr�e du secteur passif. L'absence de la r�sonance au design agrandit la dynamique totale. Les blocs d'alimentation sont r�gl�es par des semi-conducteurs. C'est la mani�re meilleure pour recevoir autour de quelques bruits de brouillage et directions d'approvisionnement avec des impedances tr�s bas qui agrandissent la performance dans la bande de fr�quences basse. Le transformateur d'alimentation se trouve dans un bo�tier d'aluminium s�par�. Sunilda comes in an lasercut, 3mm thick steel, chassis in black or silver finish and has a case similar to the Eklipse lineamplifier. Sunilda est livr� dans un bo�tier d'acier de 3mm, coup� par le laser, noir ou en argent, semblablement � celui de l'�clipse. One of audio's best-kept secrets is the AudioValve Eklipse pre-amp. All-valve, remote controlled, built to standards that you'd expect of Germans and - above all - a true bargain at �2100, it lacks only one thing: a phono section. OK, so it's toe-curlingly ugly with its black-and-gold, steam-punk-Jules-Verne-reject styling, but the sound is so good and the price so low that you can overlook the aesthetics. (Please, Herr Becker, hire an industrial designer!!!!) For those of you with a taste by-pass, the good news is that the Sunilda phono stage is built into the same chassis. 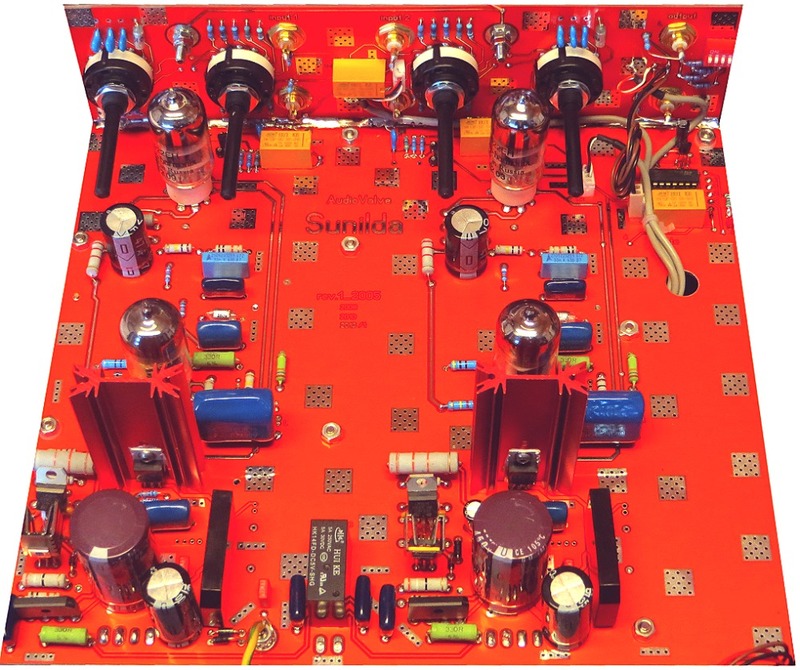 L'un des secrets le mieux gard�s d'AudioValve est le pr�amplificateur Eklipse. Aux �quipement des tubes complets, avec une t�l�commande, produit avec le standard typiquement allemand et, en outre, � une trouvaille v�ritable de seulement � 2100 il mangque seulement une chose: une section de Phono. 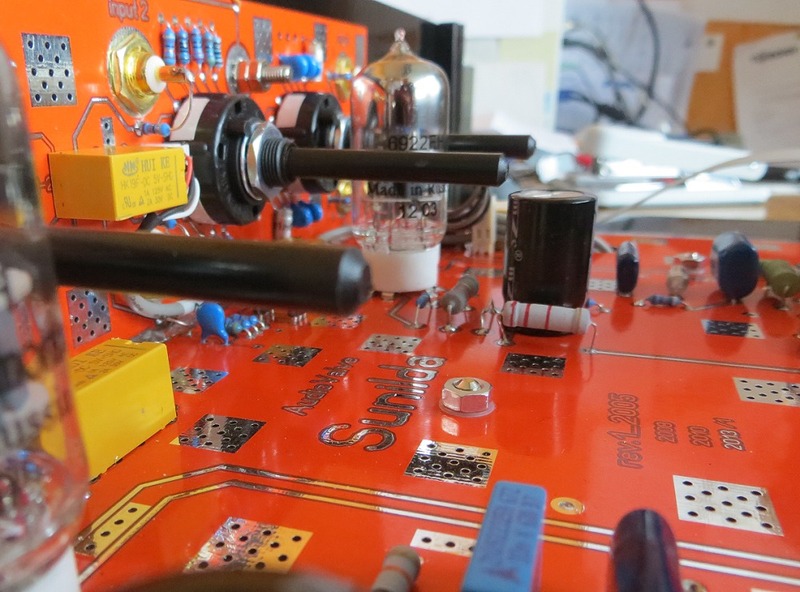 Pour ceux de vous avec un bon go�t vient ici la bonne nouvelle : L`�tage phono Sunilda est construit dans le m�me bo�tier comme l'Eklipse. If you are using a complex system, and a couple of turntables, you must pay attention to earthing to avoid a loop. You may find yourself opening AC plugs to disconnect earths. Moreover, the Sunilda responds well to quality mains leads, a solid mounting surface and a good set of phono cables to the pre-amp, which in this case was a line input on the McIntosh C2200. I used Transparent Reference, and did not earth the Sunilda to the Mac. The rest of the system included the McIntosh MC2102 and Wilson WATT Puppy System 7. What was common at all stages was a consistency that shows Becker favoured neither mm nor m-c: the Sunilda treats both equally. Where it shines is in its ability to let the user extract the most from either. I know, there are phono stages that provide even more settings, but AudioValve struck a nice balance. The only thing I would have added were oddball impedances for mm so I could tweak the Deccas, but then I've only ever found these on Tim De Paravicini's magnificent solid-state EAR 324. What made me fall in love with the Sunilda were big band mono LPs, which possess a sheen and shimmer that exists nowhere else. Trust me: Billy May LPs have to be heard in true mono. With both the Decca Maroon and the Lyra Dorian, I was able to summon up room-filling, ear-caressing sounds that can only be described as 'silky'. I hope that analogue's leading warriors, Michaels Hobson and Fremer in the USA, get hold of Sunildas, because Sunilda will prove to be a positively Wagnerian ally. If you have any doubts about the worth of vinyl in 2005, this phono stage will help dispel them. As you can imagine, competition in this sector is tough: really, really tough. I recently bought the Audio Research PH5, and - love it though I truly do - I have to admit that it's shy of adjustability, and lacks the facility for a second turntable; this makes it a pain in the arse if you like to fiddle about with cartridges and decks. Conversely, it's THE choice if you <DON'Tfiddle around. EAR's phono offerings are always magical, from the least expensive to the sublimely dear; Quad's new valve phono amp is even more of a bargain than the Sunilda; Sutherland's Phd is the quietest phono stage I've ever heard (to be reviewed soon!). As any show-goer will tell you, there are countless other superb phono amps to consider as well. 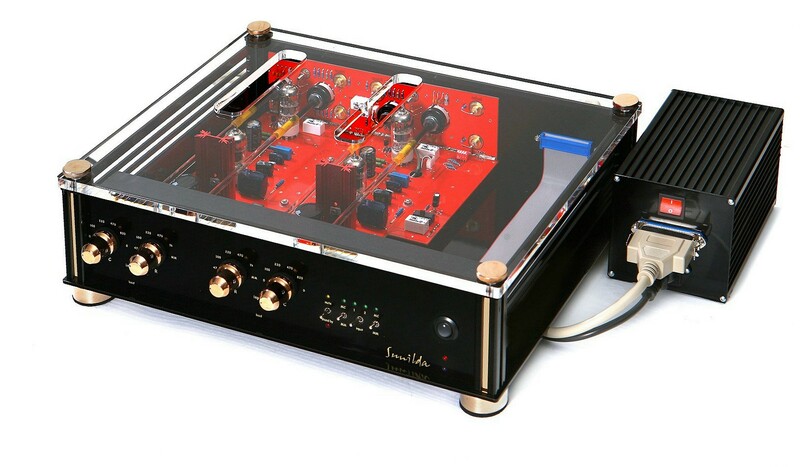 Sunilda, however, is something genuinely special: it combines the best balance of all of the above phono amps' virtues, sonically and practically, then doubles them up and sells them to you for a sane price. But take a tip from KK: order yours in silver rather than black. Helmut Becker est un ami de la m�thode de construction sans c�ble, donc reposent les entrailles de Sunilda sur une carte imprim�e bilat�rale, mise dans un monotopologie double, tous bien mont�e. Monsieur Becker ne conclut aucun compromis aux �l�ments et les choisit tous avec soin. Ainsi le couvercle transparent n'est aucune vanit� : Vous en jouirez regarder l'int�rieur. Pendant des heures. Monsieur Becker d�crit Sunilda comme un pr�amplificateur de Phono trois �tages, repos� sur des 6922 (ECC88) et 12AX7 � (ECC83)tubes de grille de cadre. Le Sunilda - nomm� apr�s la fille de Siegfried et Brunhilde - s`adapte aux des t�tes de lecture aimant rotatif et bobine d'id�e de la m�me mani�re. Ce qui enthousiasmera les amants endurcis est que Sunilda unissent dans eux-m�mes deux �tages de Phono complets, avec les deux phrases d'entr�e qui jouissent du plein compl�ment des embauches - contrairement � ceux-ci qui proposent seulement le MM ou le MC pour un ou l'autre entr�e. O� cela pourrait se r�v�ler utile serait aux bras A/B ou � des dispositifs d'id�e si on devait utiliser les m�mes t�tes de lecture dans le deux. Et si vous aviez deux assiettes de plaques-bras-constructions identiques, vous pourriez l'utiliser pour comparer des t�tes de lecture; y compris deux du m�me genre de construction et du m�me mod�le. (Demandez � des amis de Decca le mod�le-�-mod�le-variante ...). Et si vous avez 2 assiettes de plaques / bras / t�tes de lecture identiques, comme il serait donc alors avec les �ditions LP diff�rentes d'A/B. Comment 180 grammes contre 200 grammes ou une nouvelle �dition contre l'original ? Ainsi vous avez, � part pour chacune de deux entr�es, un impedance et charge capacitaire r�glables ce lequel vous pouvez r�gler dans le vol pendant vous entendez � la musique. Sur la face, vous avez quatre commutateurs d'id�e et quatre commutateurs de bouton. Les commutateurs d'id�e, deux par entr�e, mettent la capacit� sur 0, 100, 220 ou 470pf et l`impedance sur 47, 100, 220, 470, 1 kilobyte et 47 kilobyte ohm. Faites attention que le revenu est plus bas dans le mode de MM autour de 20DB que dans le mode MC, � un impedance entr�e ferme de 47k. Cela signifie que des utilisateurs les peuvent ses MCs � 47k ohms pouvoir utiliser cette valeur avec un revenu suppl�mentaire. Utilisateur de Koetsu : Si vous �tes r�jouis! 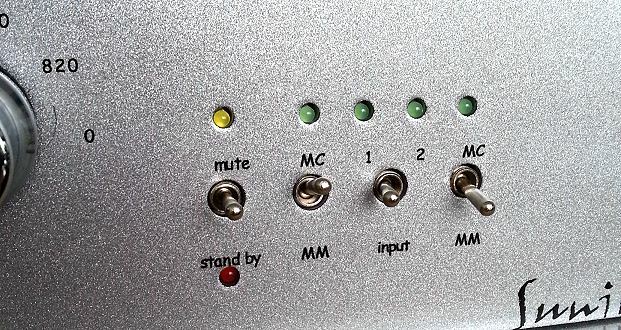 Les quatre commutateurs de bouton, accompagne par LEDs multicolores, activent de gauche � droite mode silencieux, mode op�ratoire et mode Stand-by, mm / mc choix pour l'entr�e 1, le choix d'entr�e pour l'entr�e 1 ou 3 et finalement des mm / mc hoix pour l'entr�e 2. Sur le derri�re se trouvent les deux blocs d`entr�es RCA Phono avec les mises � la terre s�par�es, une single paire des sorties RCA Phono et le coussinet pour l'alimentation en �nergie. Le point principal RIAA de Sunilda est passif et est divis� entre la premi�re et deuxi�me stage. 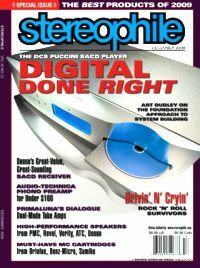 D'apr�s l'opinion de monsieur Becker �Le parcellement du secteur RIAA plus de deux marches d'amplificateur baisse frappant les pertes d'entr�e du secteur passif. L'absence de la r�sonance au design agrandit la dynamique totale.� En outre, il se prononce pour les parties de secteur r�gl�es de semi-conducteur: �C'est la mani�re meilleure pour recevoir autour de quelques bruits de brouillage et directions d'approvisionnement avec des impedances tr�s bas qui agrandissent la performance dans la bande de fr�quences basse�. Les autres agr�ments enferment un bloc d'alimentation ext�rieure qui se trouve dans un bo�tier d'aluminium s�par� et est qui est li�e aux bo�tier principal � un c�ble de degr� informatique. Le bo�tier principal lui-m�me est de l'acier de 4 mm, coup� par le laser et comme d�j� mentionn�e en grandeur absolument identiquement avec l'Eklipse pr�amplificateur. A c�t� de l'offre de Sunilda dans argent et noir, vous pouvez aussi recevoir les argent� ou dor� - enti�rement d'apr�s votre go�t. Si vous utilisez un syst�me compliqu�, et certaines assiettes de plaques, vous devez faire attention � la mise � la terre pour �viter un n�ud. Ils pourraient se surprendre eux-m�mes comme vous la prise en courant AC ouvrent autour de la mise � la terre s�parer. En outre, r�agit Sunilda bien aux lignes principales qualitatives, � une construction solide et � une bonne couple de c�bles de Phono au pr�amplificateur qui �tait une Line-Inputsur McIntosh C2200 dans ce cas. J'ai utilis� les r�f�rences transparentes et ne mis pas le Sunilda � le terre du Mac. Le reste du syst�me comportez � McIntosh MC2102 et Wilson WATT Puppy System 7. Ce qui devient clair � toutes les marches, est une consistance qui montre que Becker ne pr�f�re ne Mm ni Mc : Sunilda traite les deux de la m�me fa�on. O� elle brille particuli�rement, est dans sa capacit� de faire sortir l'utilisateur meilleur de tout. Je sais, il y a des marches de Phono m�me encore plus d'embauches mettent � la disposition, mais AudioValve a trouv� un gentil �quilibre. De mani�re suppos�e que vous transmettez correctement les c�bles, le Sunilda est particuli�rement calme, si m�me �galement avec le Sutherland Phd Et vous ne pouvez pas oublier qu'elle est compl�tement avec tubes, avec une chaleur qu'elle distingue de OHR 324. Le plus dernier n'est pas froid certes aussi, mais si exactement et st�rile qu'il ressemble dans sa pr�sentation d'un �quipement de laboratoire. Sunilda est beaucoup plus rassasi�. On a combin� la mani�re fascinante ici la transparence avec les marches de phones monolithique. Donc Becker a trouv� certains tubes avec la haute qualit�, ou, ce qui est plus vraisemblable, sorti la performance meilleure du verre utilis� qu'� vrai dire est humainement possible - quelque chose qu`il fait �galement � ses amplificateurs de power. Actuellement, il utilise pour Sunilda les tubes d'Electro Harmonix lesquels sont vraiment de premi�re qualit�. Le chaleur de Sunilda �tait contr�l� si bien qu'elle ne renverse pas l'auditeur avec un son hyperanalogue. Il est simple de travailler avec ainsi beaucoup de trucs harmonieux que chaque LP sonne plus engageant que les plus grandes sources num�riques vraiment dures. Mais cela signifierait jeter les ph�nom�nes fugitifs ou les coups de basse. Sunilda ne perd aucune perte : elle profite chaque d�tail, l'air, le sens d'un espace tridimensionnel et la mani�re du contr�le � on trouve exposer � peine quelque chose. Si vous avez besoin d'autre part d'une poign�e comme un vise sur l'affaire compl�te, vous devez changer simplement � EAR. Ce qui me faisait tomber amoureux dans Sunilda, �taient les Bibband Mono-LPs qui poss�dent un �clat et lueur qui ne se compose nulle part autrement. Faites moi confiance: Billy May LPs doivent �tre entendus simplement dans Mono juste. Avec Decca Maronneger et aussi avec Lyra Dorian, j'�tais en mesure de remplir le chambre et et faire appara�tre par enchantement les sons harmonieux flattant l'oreille, ce lequel on peut d�crire seulement comme soyeux. J'esp�re que les guerriers analogues �minents dans le USA, Michaels, Hobson et Fremer, se procureront �galement Sunildas, car ils se r�v�leront les alli�s wagnerianique positifs. Si vous nourrissez le quelconque doute concernant la valeur du vinyle � l'�poque actuelle, ce premier degr� vous aidera avec sa dispersion. Comme vous pouvez vous imaginer, s�rement, la comp�tition est dure dans ce secteur : beaucoup tr�s dur. J'ai r�cemment achet� l'Audio Research PH5 et bien que je l'aime sinc�rement, je dois admettre qu'il est retenu dans le r�glement et n'a pas la possibilit� pour une deuxi�me platine Ce qui complique les choses si vous aimez bricoler avec des t�tes de lecture. Comme tout show-festivaliers tiens � vous assurer, il ya d'innombrables autres pr�ampli phono superbe, vous devez mentionner aussi. Sunilda est quelque chose de vraiment sp�cial: il combine tous les avantages de la pr�c�dente pr�ampli phono, le son et pratique, il a doubl�, puis les a vendus � vous, � un prix en bonne sant�. Mais laissez le KK vous donnez un conseil: Commandez votre Sunilda en argent plut�t que noir. With the beginning of Autumn we want to launch our new phono stage, the SUNILDA. Of course this SUNILDA is based on our well known and well accepted phono stage SUNILDA. Mr. Becker - the designer - had the desire to increase the musical and technical features with some realy interesting improvements almost into perfection. First of all the 2 cupper sides - bottom and top - the layer thickness increased to 0,1mm on each side . 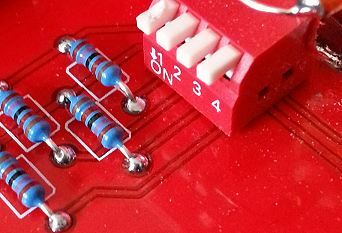 Thus, significantly reduces the resistance per unit area on the PC board and little " power islands " on the main PC board can`t built up any more. At all measured points on the PC board you will find a realistic potential of 0 Ohm. 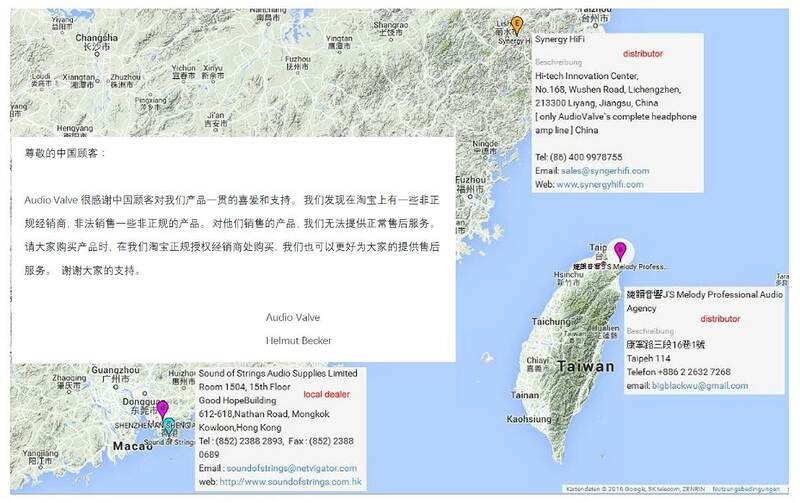 The total ground level of the PC board became more homogeneous, and so disruptive external influences will have no chance. But we wanted to have the cupper of the PC board even more thicker. To reach this we used a special technical feature, called the " MULTI VIAS"
By the help of the " MULI VIAS " , which connects the top side with the bottom side , we doubled the thickness of the cupper again, almost as if the PC board would have been built out of one complete piece of cupper. Another positive feature of this new PC board is the simultaneous improvement of the shielding effect against any kind of disturbing electromacnetic fields. Also the s/n ratio is improved so that any electromagnetic interfernces or stray power supply currents will be completly absorbed. We are sure, that in the near future also our " NEW" Sunilda will find its place in the TP Class of High End. 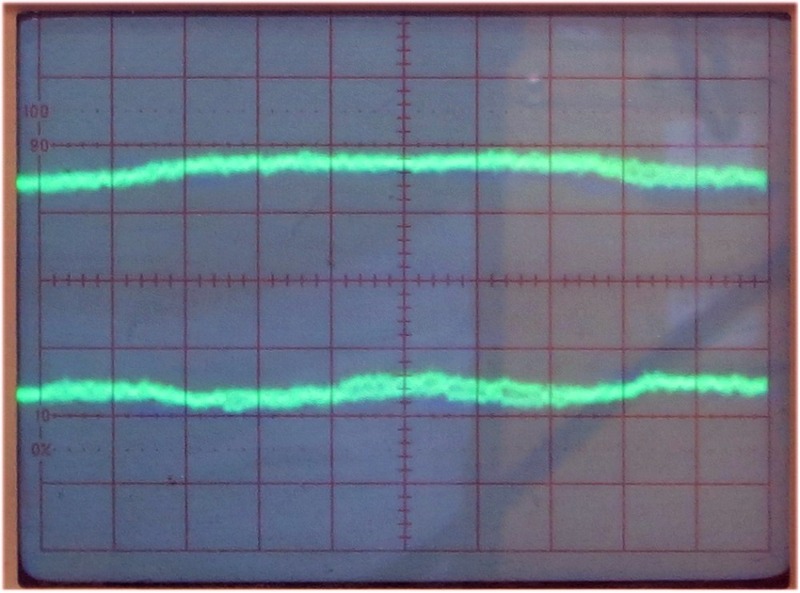 the screen from the Oscilloscope show you the maximum produced noice from the amp in the MC mode - its an absolute fantastic result for a tube phono pre amp. No hum no bee - simply nothing to hear any ground basics noises. Its AudioValve`s SUNILDA. Input stage with 6922 triode - double layer pcb technology and 70 um copper. Both sides its pcb guaranty the best result to shield provide all kinds of electric and magnetic interference. "...Germany's AudioValve is building some of the finest and affordable tubed products available today. The Sunilda is a great example. Loaded with features, beautiful sonics, and a price that makes this phono stage a veritable bargain in the context of its' competition. The Sunilda uses 2 (two) 12AX7 and 6922 each making it a tube roller's delight. Personally, I've used Telefunken, Siemens, Mullard, Amperex, and RCA among others. The many different combinations of tubes make for an unlimited number of possibilities you might find satisfying. I've been listening your Sunilda you'll be hard pressed to buy more for its' price and perhaps even a couple thousand more. Inputs for 2 MC or 2 MM cartridges at the same time; ideal for the enthusiast with a 2 tables or a table with dual tonearms. Front panel controls for loading and capacitance. External power supply for superior isolation and on and on. 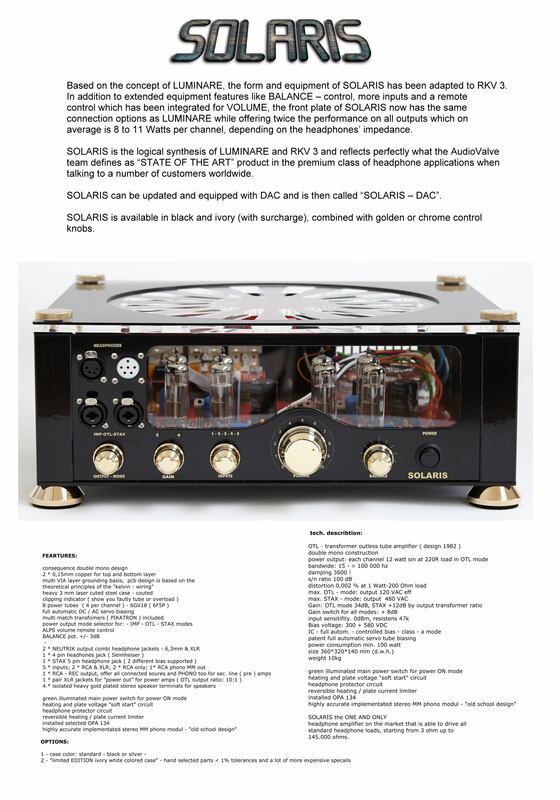 The Sunilda is one terrific value...."
"...the AudioValve Sunilda is one of the most enjoyably tube-based phono preamps I�ve heard..."
"...the Sunilda pours forth the detail, the air, the sense of a 3-D space and the kind of control that's hard to fault..."
"...as you can imagine, competition in this sector is tough: really tough. I recently bought the AR PH5, and - love it though I truly do - I have to admit that it's shy of adjustability, and lacks the facility for a second turntable; this makes a pain in the arse if you like to fiddle about with cartridges and decks. Conversely, it's the choice if you don't fiddle around. EAR's phono offerings are always magical, from the least expensive to the sublimely dear; Quad's new valve phono amp is even more of a bargain than the Sunilda; Sutherland's PhD is the quitest phono stage I've ever heard. AS any show-goer will tell you, there are countless other superb phono amps to consider as well. The Sunilda however is genuienly special. It manages the combine the best balance of all of the above phono amps' virtues, sonically and practically, then doubles them up and sells them to you for a sane price...."